With St. Patty’s Day just around the corner and the SouthSide Irish Parade this weekend I figured why not make something for the holiday. I don’t celebrate St. Patrick’s Day and have never been to the SouthSide Irish Parade. The whole drinking from the time you wake up to the time you eventually pass out in a drunken stupor has never appealed to me. 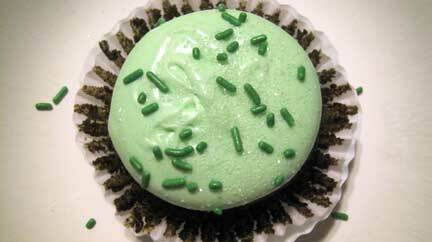 So this is the closest to celebrating St. Patrick’s Day I will get… this year at least. 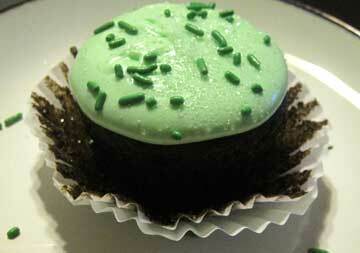 I created a Chocolate Cupcake with Mint Cream Cheese Frosting. The cake is just a regular chocolate cake recipe but I added a little instant coffee to the batter to enhance the chocolate flavor. Cream cheese frosting was not my first choice for this cupcake but I had no heavy whipping cream on hand but I did have cream cheese. I made a tiny cupcake batch so half a bar was more than enough. The cream cheese blended well with the peppermint extract. I was afraid the cream cheese flavor would be too overwhelming. 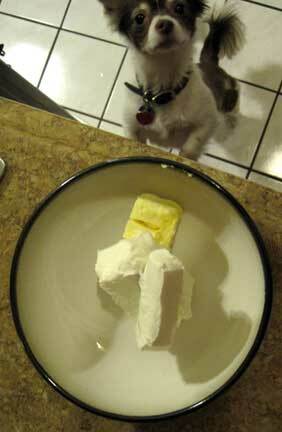 I even had a helper in the kitchen, as you can see. He’s a useless helper though. Here is the recipe if you want to know how I made it. Combine all ingredients in a standing mixer bowl and mix well.